Are You Looking for a Pedestrian Accident Lawyer in NYC? The New York accident attorneys at Gair, Gair, Conason, Rubinowitz, Bloom, Hershenhorn, Steigman & Mackauf have one of the best track records of verdicts and settlements for pedestrian accident cases in New York. For more verdicts and settlements achieved by our firm in favor of pedestrians injured or killed in pedestrian accidents see our Automobile Accidents page or our Cases of Note page. Every year in New York City and throughout the State thousands of pedestrians are injured or killed in motor vehicle accidents. In fact, over the past few years in New York City alone, hundreds of pedestrians have been killed as a result of being struck by a motor vehicle. According to the New York State government, although only about eight percent of the total traffic crashes in the state are pedestrian crashes, they are far more likely to result in serious injury or death. The majority of pedestrian crashes happen in urban areas with New York City accounting for 72% of the crashes and 59% of the fatalities involving a pedestrian. Pedestrian knock down accidents are usually the fault of the drivers of motor vehicles. Among the more common causes are drivers who speed, run traffic signals or fail to yield the right of way to pedestrians, particularly those within a crosswalk when making a turn. More recently, inattentive or distracted driving has been identified as the most common cause of motor vehicle accidents in New York. This is often seen with cell phone use and texting or simply a driver not paying attention. 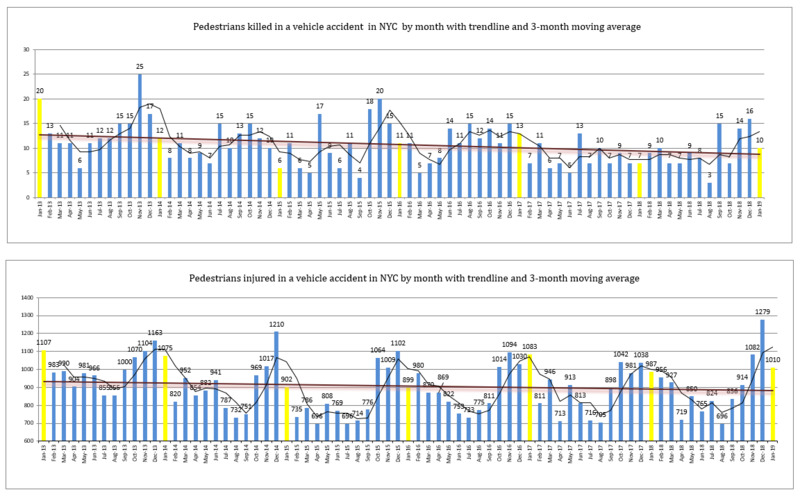 (See our blog posts for recent NYC pedestrian accidents and car accident statistics on a three-month and annual basis . Laws exist both in New York City and New York State whose goal is to protect pedestrians from being the victims of motor vehicle accidents. Often, the key to the successful resolution of these claims is having an attorney familiar with the various sections of the New York State Vehicle and Traffic Law as well as the New York City Traffic Rules and Regulations as promulgated by the New York City Department of Transportation. Additionally, unique, technical insurance laws may be implicated even if the victim of a motor vehicle accident is a pedestrian. It is imperative that an attorney be familiar with the insurance laws applicable to a given accident to insure that the victim receives the fullest recovery allowable under the law, even if that means the potential of recovery from a policy of automobile liability insurance purchased by the victim or certain members of the victim’s family. There are also laws that proscribe the time limits within which a person injured in an automobile accident must take certain steps to protect their legal rights or forever be prevented from proper and adequate compensation. Even a pedestrian struck by a Motor Vehicle may be entitled to have their medical expenses resulting from the motor vehicle accident paid for by the applicable No-Fault Insurance policy. In order to secure payment for those medical expenses, certain information and forms must be provided to the proper No-Fault Insurance provider within a limited time-period following a motor vehicle accident (typically 30 days). The failure to provide all the required information within the specific time limits may cause the denial of an injured person's right to payment of necessary medical expenses. As mentioned previously, pedestrian accidents often result in serious injuries. In many accidents, a pedestrian sustains what is commonly known as a “bumper fracture.” This occurs when a car bumper hits the pedestrian's pelvis and legs shattering his or her bones. Another common injury involving pedestrians occurs when a pedestrian is "scooped" off the ground by the front of a car and smashed onto the hood and the windshield causing traumatic brain injury. Further compounding this injury is the natural reaction of the driver to step on the brake. This results in the pedestrian being thrown to the ground, causing further injury to the brain as well as spinal and pelvic injuries. The personal injury attorneys at our firm have helped thousands of individuals and families suffering serious injuries or death as a result of a pedestrian being struck by a car, truck, bus or other motor vehicle. We retain expert accountants, financial analysts and economists because every personal injury case has its own set of associated costs, including pain and suffering, lost wages, the cost of care and many other monetary costs. In order to accurately assess what these costs will be for the remainder of a victim's life, we use financial professionals to derive fair resolutions for injury victims. Additionally where necessary we retain the best accident reconstruction engineers in the field. It is also often necessary to retain a biomechanical engineer where the cause of the injury is challenged. The pedestrian accident attorneys at Gair, Gair, Conason, Rubinowitz, Bloom, Hershenhorn, Steigman & Mackauf advocate for our clients' full financial recovery through detailed, meticulous preparation for trial. If you or a loved one has been injured in an automobile, truck or bus accident, please contact our firm to discuss your case.